We’re happy to announce support for Adobe’s newest release: Creative Cloud 2015.3. 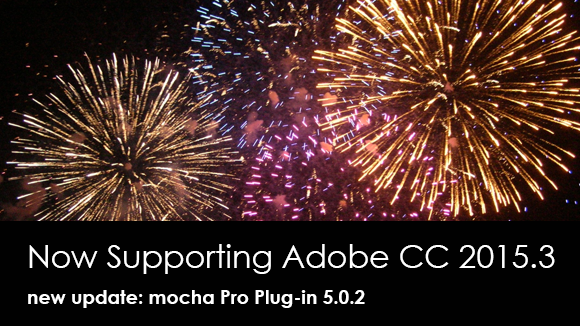 Mocha Pro 5.0.2 now supports Adobe Premiere Pro CC 2015.3 and After Effects CC 2015.3. This is a free point release update for all owners of the new Mocha Pro 5 Adobe Plug-in. Haven’t tried the plug-in yet? Download a fully working 14 day trial! Tech Tip: if you are updating your Adobe CC apps to 2015.3 and wish to keep older version, remember to deselect “Remove Old Versions”. More info can be found here.